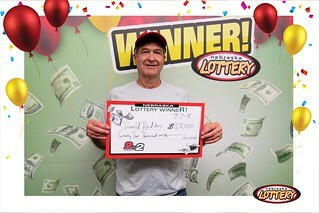 Donald Diediker of Laurel won $22,000 playing 2by2 from the Nebraska Lottery. Diediker purchased his winning ticket from Rath’s Mini Mart at 206 Highway 2 in Laurel. The ticket contained the winning Red ball numbers (04, 07) and White ball numbers (01, 05) from the July 13 drawing. While claiming his prize on September 7, Diediker said that 2by2 is his favorite Lotto game from the Nebraska Lottery and it’s easy to see why. This was Diediker’s second 2by2 win. He won the 2by2 top prize back in October of 2014 and he’s kept playing ever since, picking his own numbers and playing family birthdays and anniversaries. The last time he won the 2by2 jackpot, Diediker bought a car for his wife Erica and some new trees for their backyard. This time he’ll be investing the money to start a college fund for his five young grandchildren. The odds of winning the 2by2 top prize are 1 in 105,625. The overall odds of winning any prize in 2by2, which is also offered in Kansas and North Dakota, are 1 in 3.59.